A number of pieces were constructed during the Central Park installation of “Six Lines,” exploring the intersections of found dumpster materials. New York has a treasure trove of abandoned sidewalk materials, in this case, mature bamboo stalks and a half circle mirror. Using the “given” materials and the organizing principle of the “intersection of each piece with the others” of the “passing through” of each part, of the “display of each part” as a “structural part,” this piece was arranged on the garment studio floor. 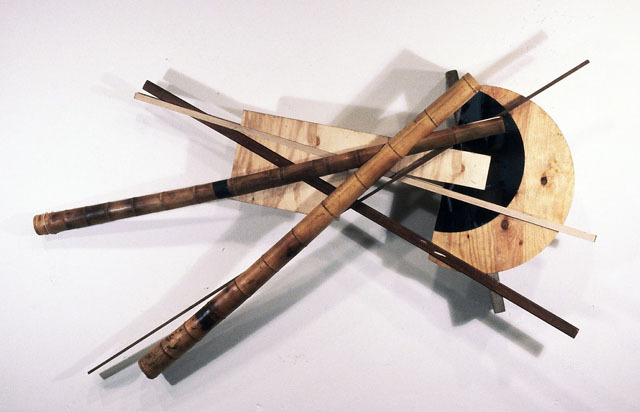 Dado groves were cut into the materials so that the parts would truly intersect and not just overlap. The mirror brought the viewer into the work in a new way. The piece was given to Horace Brockington in 1982.